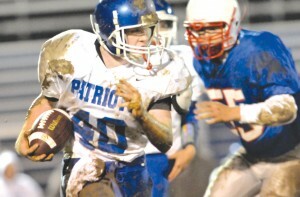 Estill County Middle School Football Patriots Coach Austin Moore said he knew his team didn’t have much of a chance against powerhouse McNabb. But the way this team plays the game and how well they behave makes them all winners. The 8th grade Pats went three and six on the season, which is what the coach calls a decent season. The 7th grade team only had one win. But their behavior and compassion for somebody less fortunate on the McNabb team was exemplary. It seems McNabb has a boy on their team who is somewhat handicapped and every game that the team gets a few touchdowns ahead of their opponents the coach puts him in the game. Moore said he asked Stockdale if the boy had ever got to run for a touchdown. “I talked to our boys and asked them if they wanted to let the boy make a touch down and they said they did,” Moore said. “They not only let the boy take the ball into the end zone, they raqn with him. They are all good sports and I was proud of them,” Moore said. Photo by Mike Hanson-Gregery Stamper makes a run for the goal line.